'Gronzyi Monarkh' (Andrii Troshkin, R. 2014). Seedling# TB10199-1. 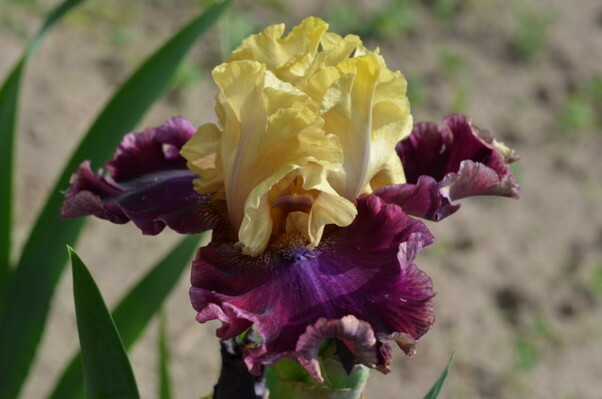 TB, 31.5" (80 cm), Midseason late bloom. Standards and style arms pale green-yellow (RHS 13D), slight flush of lavender at midribs, bubble laced edges; falls dark purple (79B), fine purple-pink (70D), very ruffled edge, small blue blaze below beards; beards moderate orange (167C) in throat and middle, strong blue (100B) at ends; slight fragrance. 'High Class' X 'Decadence'.